The view to the west as severe weather approached. We received a scare tonight when the National Weather Service and local TV stations issued tornado warnings for our town! 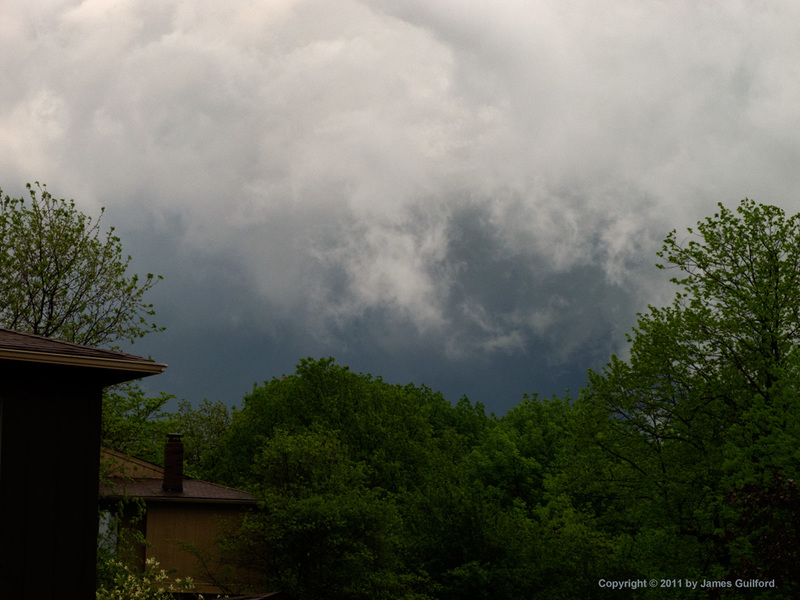 A little after 7:00 PM the skies grew very dark and the clouds turned bumpy and ragged and moved about in chaos. Wind and rain built, nickel-sized hail fell. She Who Must Be Obeyed grabbed her purse and the cat and headed for the basement. I stood by a partly-open window to monitor the weather’s sounds and actions, ready to flee myself if conditions warranted. Fortunately we escaped the worst weather though areas north of us did not. There were many reports of trees down, buildings and utility poles suffered wind damage, and there was local flooding. Local media misidentified several amateur images of cloud formations as tornado funnels though one possibly was the “real deal.” I am waiting to hear from Observatory neighbors to learn whether Hiram escaped serious damage — weather radar showed the worst of the storm passing directly over the village! We expect no more excitement tonight but this was enough, thank you! Deep dark clouds to the distance and lighter, whirling clouds closer in make a dramatic sight after the storm passed. The photos show a really menacing sky so I’m glad you didn’t suffer any damage. There has been wicked weather across the country recently. The Weather Service reports there were no actual tornadoes here but the winds did plenty of localized damage. One area I drove through seemed to be plastered with shredded leaves torn from trees! 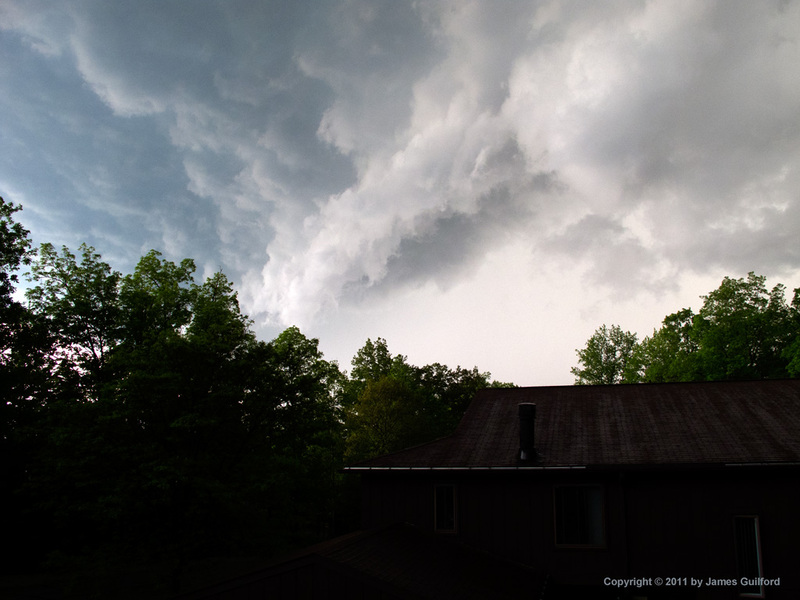 I was thrilled by the dramatic skies but, I’ll admit, was ready to sprint for the basement if things got dangerous! Wow! Scary! We had a tornado warning just as schools were letting out. They held the kids in the schools and we herded our upstairs patrons to the basement level of the library. Power went out for about 40 minutes and we got 3″ of rain in a very short time. Our home basement took on some water but never flooded. We are grateful!